Includes MP3 decode, MPEG-2 encode and decode, and MPEG-4 encode and decode, each of which are applied to five different datasets for a total of 25 results. A collection of four benchmark tests for common cryptographic standards and algorithms: the Advanced Encryption Standard (AES), the Data Encryption Standard (DES), the Rivest-Shamir-Adleman (RSA) algorithm for public-key cryptography, and Huffman decoding for data decompression. JPEG and color-space-conversion tests, including JPEG compress, JPEG decompress, RGB to YIQ, RGB to CMYK, and RGB to HPG. Each of these is applied to seven different datasets for a total of 35 results. A floating-point version of MPEG-2 Encode benchmark, using single-precision floating-point instead of integer functions. 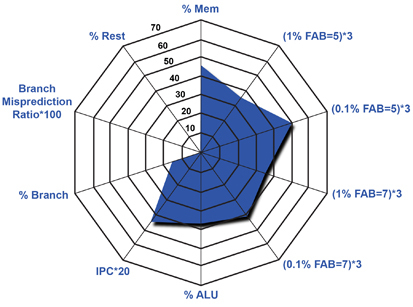 EEMBC benchmark characterization data allows designers to better understand how to interpret EEMBC benchmark scores relative to certain processor characteristics. The Kiviat graph above, which visualizes multivariable data in a way that easily reveals program behavior, shows workload characteristics for the MPEG-2 Decode benchmark within DENBench 1.0. 4. Special licensing program for faculty members at colleges and universities. Benefits of licensing and membership are summarized in the table below.